≈250 B.C. – Ctesibius, an ancient Greek engineer and mathematician, invented a water clock which was the most accurate for nearly 2000 years. ≈60 A.D. – Hero of Alexandria designs the first automated programmable machine. These ‘Automata’ were made from a container of gradually releasing sand connected to a spindle via a string. By using different configurations of these pulleys, it was possible to repeatably move a statue on a pre-defined path. 1898 – The first radio-controlled submersible boat was invented by Nikola Tesla. 1921 – The term ‘Robot’ was coined by Karel Capek in the play ‘Rossum’s Universal Robots’. 1948 – William Grey Walter builds Elmer and Elsie, two of the earliest autonomous robots with the appearance of turtles. The robots used simple rules to produce complex behaviours. 1950 – Alan Turing introduces the Turing test in his 1950 paper ‘Computing Machinery and Intelligence’. 1954 – The first silicon transistor was produced by Texas Instruments. 1956 – George Devol applied for a patent for the first programmable robot, later named ‘Unimate’. 1957 – Launch of the first artificial satellite, Sputnik 1. 1961 – First Unimate robot installed at General Motors, used for die casting and spot welding. 1965 – Gordon E. Moore introduces the concept ‘Moore’s law’, which predicts the number of components on a single chip would double every two years. 1966 – Work began on the ‘Shakey’ robot at Stanford Research Institute. ‘Shakey’ was capable of planning, route-finding and moving objects. 1969 – The Apollo 11 mission, puts the first man on the moon. Landing was made inside the Lunar Module ‘Eagle’. 1970 – Luna 17 lands on the moon, carrying the roving remote-controlled robot, Lunokhod 1. 1971 – Intel introduce the first commercially available microprocessor, the 4004. 1975 – The space probes Viking 1 and 2 were launched each with an articulated robot arm. 1976 – The film Star Wars is released introducing R2-D2C-3PO. 1984 – The film Terminator is released, with Arnold Schwarzenegger as a cybernetic organism or cyborg. 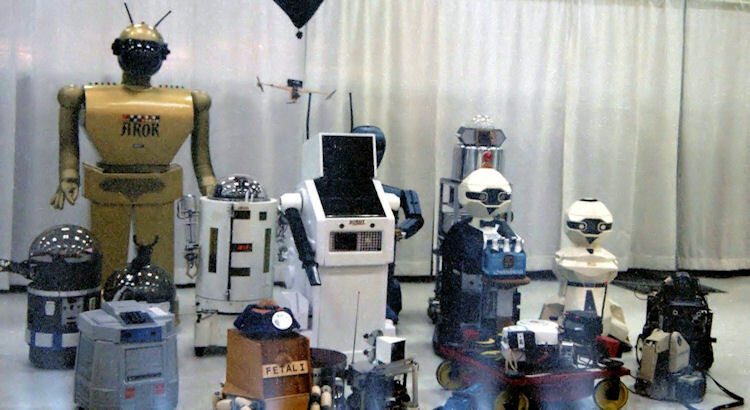 1986 – Honda starts work on its first humanoid, robot named ‘E0’ (later to become ASIMO). 1988 – SCAMP designed as the first robot pet with emotions. 1989 – Mark Tilden introduces BEAM robotics, beam being an acronym for Biology, Electronics, Aesthetics, and Mechanics. 1991 – First HelpMate mobile autonomous robot used in hospitals. 1997 – Sojourner becomes the first rover to land on Mars as part of the Mars Pathfinder mission. 1998 – Lego enters the robotics market with its first version of Lego Mindstorms. 1999 – Sony introduces AIBO, an autonomous robotic dog capable of seeing, walking and interacting with its environment. This was followed a year later by the SDR-3X humanoid robot later known as QRIO (both discontinued in 2006). 2000 – Honda unveils ASIMO, the first non-prototype release of its humanoid robot. 2001 – US Air force test the MQ-1 Predator, the first armed unmanned aerial vehicle (UAV) fitted with two Hellfire missiles. 2002 – iRobot introduces Roomba, a personal robotic vacuum cleaner. 2003 – Osaka University unveils their first ‘Actroid’, the term given for a humanoid robot with strong visual human characteristics. 2004 – The first DARPA Grand challenge is help. Sponsored by the US department of defence, the challenge is designed to create autonomous vehicles for warfare. 2004 – The Mars rovers Spirit and Opportunity land on Mars. As of November 25th 2009 The rover Spirit has completed 2150 days of its 92 day (90 sol) mission. 2010 – NASA and General Motors join forces to develop Robonaut-2, the new version of NASA’s humanoid robot astronaut. 2012 – Baxter, an industrial robot built by Rethink Robotics, is released, aimed at production line tasks in medium sized companies. 2013 – Boston Dynamics is bought by Google X, the top secret division of the internet search giant Google.